On Wednesday 12th September, AustCham Thailand organized an ESB Member Briefing on Shifting Safety Culture in the Workplace at WHA Plaza 3. We would like to thank Mark Everstyn, General Manager at Linfox International Group for sharing us with insights of Linfox’s Vision ZERO, a program dedicated to safety, which has resulted in major reduction in incidents across Thailand since its introduction. Also thanks to WHA Industrial Development PLC, our venue sponsor, who was a part of making this event happen. AustCham Thailand met with representative from Thailand Convention & Exhibition Bureau (TCEB) – and the Ministry of Labour, to discuss various issues facing businesses dealing in the MICE sector, including Customs, Visas, and Infrastructure. We would like to thank for their time – Mr. Akapol Sorasuchart, Chairman of the Sub-committee on the Government Coordination for MICE Logistics Facilitation; Ms. Wiparat Tharateerapab, Director of Government & Corporate Affairs (GCA- TCEB); Ms. Ubonrat Wiriyakul, Senior Manager of Government & Corporate Affairs (GCA- TCEB); Mr. Pattanachai Singhavara , Senior Manager of Area Based (TCEB); Mr. Phuwakorn Tosingkhon , Chief of System Management Group on Foreign Workers – Skilled Labour Department of Employment – MOL. On Friday 7 September 2018, AustCham Thailand, in collaboration with AMCHAM, BCCT, Franco-Thai and NTCC, held Phuket Sundowners at the Phuket Boat Lagoon. Surrounded by the resting vessels, our members and guests enjoyed networking with like-minded people from the business community. Also, prior to the Sundowners, we organised a Panel Discussion on the “The expectations of the Phuket Hotel and Tourism industries from the Phuket marine industry, and vice versa” with special panelists from related marine industry, i.e, Lyndon Ellis; GM, Anantara Vacation Club, Zara Tremlett, ex GM of Yacht Haven Marina and member of Phuket Go Boating group, Ian Lancaster, retired international insurance broker living in Phuket and major shareholder of MV Olympia a luxury charter boat based at Ao Po marina and Scott Duncanson; Commodore of Phuket Yacht Club and GM of ISS Facility Services Thailand. Thank you them for sharing us with valuable knowledge and different perspectives on concerning issues. Finally, we would like to thank our venue sponsor, Phuket Boat Lagoon;our corporate sponsor, Wine Pro; our event supporters, Lady Pie Phuket and Ocean Marina Yacht Club, Pattaya; and our media partner, The Phuket News, for making these events successful. 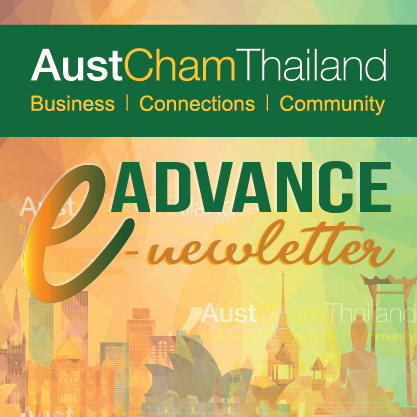 On Wednesday 5th September 2018, AustCham Thailand held September Sundowners at Sofitel Bangkok Sukhumvit. It was a fantastic night where members and guests enjoyed variety of premium live station foods whilst networking. Additionally, we organized AustCham Member Briefing on “Dealing with Stress in the Workplace” prior to the networking session. Thanks to our keynote speakers—Dr Alisara Amy Ariracharakaran, Coordinating Physician, International Patient Experience at Bumrungrad International hospital; Ms. Mei-lynn Chan, Director, Group Organizational Development People & Organization at DKSH (Thailand); and Mr. Dale Lee, Managing Director of CoffeeWorks —for sharing essential knowledge regarding stress both in term of physical and mental, as well as their valuable experience and suggestions. We also would like to thank our corporate sponsor, Bumrungrad International Hospital, and our venue sponsor, Sofitel Bangkok Sukhumvit, for making these events successful. On Tuesday 4th September 2018, AustCham Thailand’s Members attended the Customs Alliance Certificate Presentation Ceremony at the Thai Customs Office. Bangkok Beer & Beverages co., ltd.
BESTON GLOBAL FOOD (THAILAND) CO.,LTD.